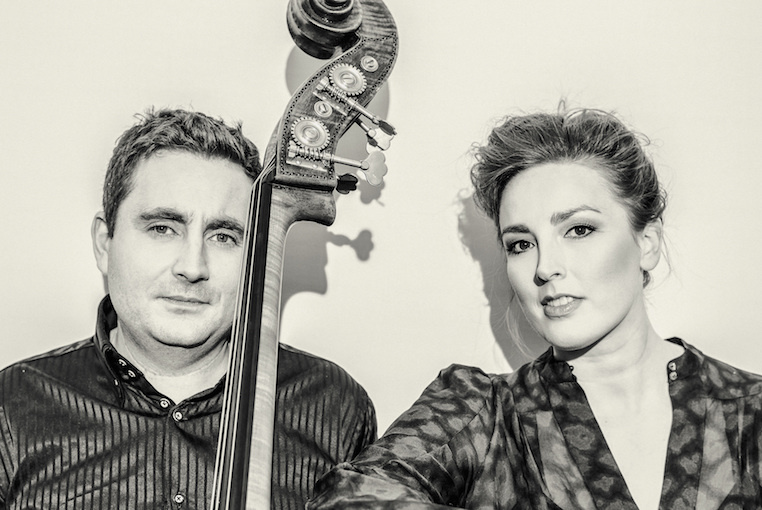 A duo only with vocal and bass pairs Danish jazz singer Sinne Eeg with Danish bassist Thomas Fonnesbæk. Purposely intended to feature Sinne in an open and bare setting and as a departure from her previous lush recordings. Sinne’s voice has a lush timbre that marries perfectly with Fonnesbæk’s warm bass sound. Eeg and Fonnesbæk listen intensely and inspire each other to take chances. But spontaneity, communication and interpretation is, after all, the essence of jazz. The two are like dancers who are finely tuned and responsive to each other’s every gesture. The results are simply captivating. The duo released their debut album EEG-FONNESBÆK in 2015 which garnered a Danish Music Award (Denmark’s Grammy) for Best Jazz Vocal CD. The number of vocal/bass duo recordings is quite small. EEG-FONNESBÆK stands easily with the best of Sheila Jordan’s duet albums with Harvie S, Steve Swallow, and Cameron Brown. You can hear how their harmonic sensibilities play off each other, creating a rich emotive tapestry and full sound despite the absence of other instrumentation. They take the limitations of the duo format and turn it into an opportunity for greater creative freedom and self-expression that only musicians with great skills and empathy can achieve. But that’s always been Sinne’s modus operandi. Although she’s firmly rooted in the traditions of the great jazz vocalists, Sinne is an artist who never settles for past modalities. Rather, she prefers to push herself into new territories in her recordings and live performances. She is also a prolific songwriter. Although her other albums featured Sinne’s catchy originals, EEG-FONNESBÆK focuses mostly on standards, Eeg manages to keep the essence of these chestnuts while taking them to new and fresh places that are imbued with her own personality and sensibilities. Sinne Eeg’s distinctive vocals have earned her a loyal and rapidly growing fan base in her native country of Denmark and around the world. Considered the preeminent jazz vocalist in Scandinavia, Sinne has already made her mark in the USA, Japan, China, and throughout Europe with her exquisite live performances and award- winning studio recordings. As a singer she is influenced by Nancy Wilson, Betty Carter and Sarah Vaughan, but adds her own personal touch of soft darkness influenced by Scandinavian melancholy. Even without a drummer to keep time or a pianist to play chords, Sinne retains all her artistry and interpretive powers. Among the prizes and awards Sinne has won in her career are the Danish Radio Jazz Award in 2009, and the prestigious Ben Webster Prize in 2014. She is a 4 times winner of the Danish Music Award (an equivalent to the American grammy) for Best Vocal Jazz Album of the year. In 2014. Additionally In 2015, the Academie du Jazz (France’s top 60 critics) honored Face the Music with one of Europe’s most distinguished awards. Thomas Fonnesbæk is an award winning, in-demand Danish bass player who has appeared on more than 100 CDs. Through the last years Fonnesbæk has evolved to one of the best and in demand bass players in the world playing and recording with other top artists such as Enrico Pieranunzi, Justin Kauflin, Lars Jansson, Sinne Eeg, Monty Alexander, Arron Parks and many others.